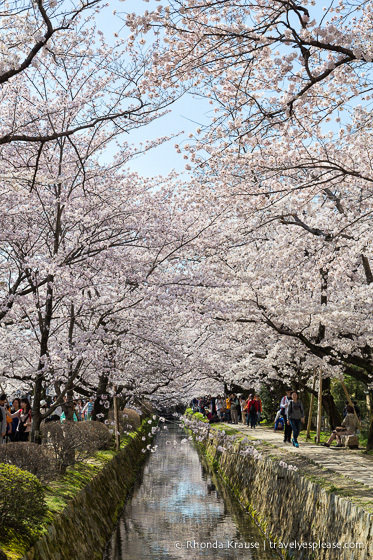 Kyoto is one of the best places in Japan to enjoy the cherry blossoms, so soon after arriving we eagerly headed off to one of the most popular sakura (cherry blossom) viewing spots in Kyoto– the Philosopher’s Path. The Path of Philosophy is a gorgeous place to go for a stroll when the cherry trees are in full bloom. Pink blossoms hang down over a narrow, cobblestone path, following close beside a gentle flowing canal at the base of the Higashiyama (Eastern Mountains). Tourists and locals alike, follow each other two-by-two down the cherry tree lined path. The convoy of people stops at almost every bridge crossing the canal. These are where you get some of the best views of the branches arching over the water. Cameras are snapping, people are posing and laughing but somehow I still sense the path’s romanticism. Looking around, it’s easy to see why people are drawn to this path, and have been for years. Kyoto University philosophy professor Nishida Kitaro (1870-1945) used to walk along this route daily, lost in thought. It was his love of this path, that led to it eventually becoming known as the Path of Philosophy. The Philosopher’s Path begins at Ginkaku-ji, the so-called Silver Pavilion, even though the temple never received its intended coating. Before setting off on your walk, make a quick visit inside to see the pretty garden, a focal point of which is the Moon Viewing Sand Mound and the perfectly raked Silver Sand Sea. After visiting Ginkaku-ji, start walking south along the Shishigatani canal. The path is gracefully shaded by cherry blossoms and lined with shrubs. Along the way there will be some shops and cafés, but thankfully they don’t overwhelm the area. As you make your way down the path, watch for signs pointing towards small temples and shrines that lie a few blocks off the main route. You’ll probably even come across some cute cats hanging out at the southern end of the path. If you don’t stop to explore any of the sights off the path, the Philosopher’s Walk should take you about 30 minutes. The path ends just north of Eikan-do Temple. If you still feel like walking, Nanzen-ji, an important Zen temple, is just a little further up the path. Walking the Path of Philosophy was a great start our 3 day trip to Kyoto. It was a relaxing and scenic way to get our first taste of the temples and natural beauty Kyoto is known for. The Philosopher’s Path is located in the Northern Higashiyama district of Kyoto. The path is 2 km long and takes roughly 30 minutes to walk. The cherry blossoms usually are in bloom late March-early April. To search for hotels near the Philosopher’s Path, please visit Booking.com, our trusted booking site that we use for all our trips. Accommodations booked through the included link earn us a small commission, at no extra cost to you, and help support this website. Thank you! Frank - Beautiful! Are they in bloom all year long or is there a specific season to see this?